TORONTO, ONTARIO--(Marketwire - Aug. 26, 2010) - U3O8 Corp. (TSX VENTURE:UWE) a Canadian- based company focused on exploration and resource expansion of uranium and associated commodities in South America, reports significant values of uranium, phosphate, vanadium, yttrium and molybdenum from rock-chip samples taken in an additional 15 trenches of the 29-trench program completed in the Berlin Project in Caldas Province, Colombia, South America. The Berlin Project is a sandstone-hosted uranium prospect with a historic resource1 of 12.9 million tonnes at an average grade of 0.13% U3O8 (38 million pounds U3O8) estimated from the southern 4.4 kilometres ("km") of a 10.5km long mineralized trend. "U3O8 Corp's trenching confirms that the mineralized zone at Berlin extends over a 3km strike length at an average grade and thickness that is consistent with historic results," said Dr. Richard Spencer, U3O8 Corp's President and CEO. "Trenching continues to the north to confirm historic uranium data that shows the whole of the 10.5km long sandstone trend is prospective. An initial 1,500 metre drill program is scheduled to commence in September, aimed at verifying the results of historic drilling as we move towards our goal to position the Berlin Project for potential National Instrument 43-101 ("NI 43-101") resource estimation in 2011." Dr. Spencer continued, "Phosphate in the Berlin Project is contained in the mineral apatite, which is the principal source of phosphate for agricultural fertilizer. Therefore, the Berlin Project has the potential to generate phosphate for fertilizer while producing uranium, vanadium, yttrium and other metals as co- products. Fresh, mineralized rock from the forthcoming drill program will undergo metallurgical investigation, aimed at emulating the results of historical test-work that indicate the potential to separate phosphates and uranium at Berlin using a standard industrial process common to the fertilizer industry." Summary assay results for the 29 trenches that have been completed in the southern part of the Berlin Project (Figure 1). Potential quantity and grade are conceptual in nature. There has been insufficient exploration to define a mineral resource in the Berlin Project to date and it is uncertain if further exploration will result in the target being delineated as a mineral resource. Assay results from the trenches to date show continuity of uranium, phosphate and vanadium with variable yttrium and molybdenum mineralization over a strike length of approximately 3km on the eastern flank of the keel-shaped fold at Berlin (Figure 1). Trenches on the western limb of the fold are less regularly spaced because the target sandstone layer is cut off below surface by an alaskitic batholith in some areas (Figure 2). Since the sandstone does not reach surface in these areas, it cannot be trenched and further exploration of the western flank of the fold will be done by drilling. Historic reports of mineralization in the northern part of the fold suggest the whole of the sandstone unit, which extends over an area of 10.5km long by up to 2km wide, is prospective for uranium (Figure 3). Historic exploration did not evaluate vanadium, phosphate, yttrium and molybdenum potential in the project area. Trenching has started in the northern part of the property and a 1,500 metre drill program is scheduled to commence in the southern part of the property in September. Contingent on successful drilling of potentially economic uranium grades, metallurgical test work will be done with preliminary results expected in early 2011. U3O8 Corp. aims to undertake an extensive drill program on the Berlin Project next year, towards a potential NI 43-101 resource estimate in late 2011. The mineralized unit exposed in trenches in the southern part of the Berlin syncline is a fine- to medium- grained sandstone that lies immediately beneath organic-rich black mudstones. The sandstone contains some organic fragments and variable quantities of bitumen. Petrographic studies show that the sandstone is largely cemented by fine-grained phosphate crystals that have been identified as fluorapatite (Ca5(PO4)F) with which the uranium is suspected to be associated. The texture of the fluorapatite shows that it is secondary mineral that precipitated in situ – the host rock is not a phosphatic black shale of sedimentary origin. The keel of the fold at Berlin reaches a maximum depth of about 250 metres below surface in the project area. Since the mineralized layer is one to six metres thick, and the land is very rugged, an underground mining scenario is envisaged with access from adits located at lower elevations. Mineralization at Berlin lies within permeable sandstone where it lies in contact with a chemically reactive rock, the organic-rich mudstone. U3O8 Corp's exploration model is that a uranium-bearing fluid flowed within the sandstone unit and reacted with reduced fluids derived from the mudstone, causing the precipitation of uranium, associated metals and phosphate. The source of the mineralized fluid is suspected to be the alaskitic batholith that intrudes the western side of the Berlin fold. Alaskite is the same type of rock from which uranium is mined in the large Rossing mine in Namibia. Analyses of the alaskite at Berlin shows that it contains tens of parts per million ("ppm") uranium and molybdenum, hundreds of ppm yttrium and several thousand ppm phosphate and fluorine; and therefore is a viable source for mineralization in the sandstones. The bitumen and vanadium mineralization, in contrast, is likely to have been derived from the mudstones that overlie the sandstone. In the Berlin Project, significant grades of uranium associated with phosphate, vanadium, yttrium and molybdenum contribute to a high in situ value for this multi-commodity prospect. fluorapatite is the phosphate mineral found at Berlin. Phosphate along with nitrogen and potash constitute the three principal components of agricultural fertilizers. The Berlin Project lies in the agricultural heartland of central Colombia – a favourable location for the potential production of fertilizer. significant potential for electric car batteries and large-scale energy storage units in emerging technology such as the vanadium redox-flow battery (VRB). VRB's can absorb and discharge large amounts of electricity simultaneously and instantaneously, recharge thousands of times and contain no toxic materials. VRB's are proving to be a crucial component of green and conventional power grids since they can be charged with excess electricity during low-peak periods and then can feed power back into the grid as demand rises. used in the production of electrodes, electrolytes, electronic filters, lasers and superconductors. used as an alloy to strengthen steel. Trenches were excavated by hand perpendicular to the strike of the contact between the sandstone unit and the overlying black mudstone strata. Continuous rock-chip samples were taken from the side walls of each trench and were bagged and numbered on site and delivered to ALS Laboratory Group's preparation facility in Bogota, Colombia. Samples from Berlin are subjected to a rigorous and comprehensive QAQC program. Quality control samples constitute 13% of the material assayed by the laboratory. Of each hundred samples, four are standards that were prepared by ALS Chemex from mineralized rock from the Berlin Project, three are field blanks, three are field duplicates, two are ten mesh duplicates, taken after initial crushing of the sample in the preparation lab and one is a pulp duplicate taken after the sample has been pulverized in the lab. Inductively Coupled Plasma Emission Spectroscopy ("ICP-AES") after the sample has been dissolved in aqua regia (ALS Chemex Method Code ME-ICP41). This method provides analyses for a large number of elements, but the assays of some elements are artificially low since the rock may be incompletely dissolved. Inductively Coupled Plasma Mass Spectroscopy ("ICP-MS") after the sample has been dissolved by a mixture of four acids (ALS Chemex Method Code ME-MS61). This type of analysis was required to obtain representative assays for elements such as yttrium and zirconium. Samples that have very high phosphate contents were analyzed by X-Ray Fluorescence Spectroscopy (XRF) using ALS Chemex Method Code XRF12. Dr. Richard Spencer, President & CEO of U3O8 Corp., a Qualified Person within the definition of that term in NI 43-101 of the Canadian Securities Administrators, has verified the technical information in this release. All scientific and technical information contained in this press release has been prepared under the supervision of Dr. Spencer. The majority of the prior exploration on the Berlin Project was conducted by the French company, Minatome, between 1978 and 1981. During this time period, 11 bore holes were drilled, 20 trenches were dug and three adits were excavated. The historic estimate was generated on the southern 4.4km of a 10.5km long syncline (Figure 3). Historic data from trenching shows that anomalous grades of uranium continue along strike to the north. (1) The Berlin resource estimate is historical and is reported in Castano, R. (1981), Calcul provisoire des reserves geologiques de Berlin, sur la base des resultants des sondages, unpublished Minatome report, 15p. There has been insufficient exploration work completed to verify the historic estimate. U3O8 Corp. is not treating the historical estimate as current mineral resources and it should not be relied upon or considered a NI 43-101 compliant resource. As the 38 million pound U3O8 historic estimate is based only on 11 widely-spaced drill holes, it is regarded by U3O8 Corp. as merely an indication of the magnitude of the uranium resource potential of the southernmost 4.4 kilometre long portion of the syncline containing the Berlin uranium mineralization. U3O8 Corp. is a Toronto-based exploration company focused on exploration and resource expansion of uranium and associated commodities in South America – a promising new frontier for exploration and development. U3O8 Corp. has one of the most advanced portfolios of uranium projects in the region comprising NI 43-101 compliant resources in Guyana to significant historic resources in Colombia and near-resource and discovery potential in Argentina. 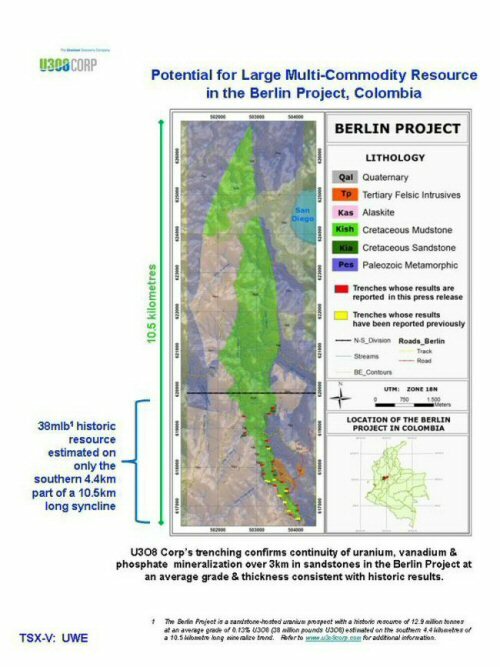 For further information on U3O8 Corp's Berlin Project, refer to the technical report entitled "Review of Historic Exploration Data from the Unaniferous Black Shales of the Berlin Project and Chaparral Concession, Colombia: A guide to future exploration" prepared by Richard Spencer and Richard Cleath dated March 23, 2010 and available at www.sedar.com. Additional information on U3O8 Corp. is available on the company's web site at www.u3o8corp.com. Certain information set forth in this news release may contain forward-looking statements that involve substantial known and unknown risks and uncertainties. These forward-looking statements are subject to numerous risks and uncertainties, certain of which are beyond the control of U3O8 Corp., including, but not limited to, the impact of general economic conditions, industry conditions, volatility of commodity prices, risks associated with the uncertainty of exploration results and estimates and that the resource potential will be achieved on exploration projects, currency fluctuations, dependence upon regulatory approvals, and the uncertainty of obtaining additional financing and exploration risk. There is no assurance that the Berlin Project will add to U3O8 Corp's resource base in the short- term, or at all. Readers are cautioned that the assumptions used in the preparation of such information, although considered reasonable at the time of preparation, may prove to be imprecise and, as such, undue reliance should not be placed on forward-looking statements. To view Figure 1, please visit the following link: http://media3.marketwire.com/docs/U308_figure1.pdf. To view Figure 2, please visit the following link: http://media3.marketwire.com/docs/U308_figure2.pdf. To view Figure 3, please visit the following link: http://media3.marketwire.com/docs/U308_figure3.pdf. To view the photo associated with this Press Release, please visit the following link: http://media3.marketwire.com/docs/U308.jpg.